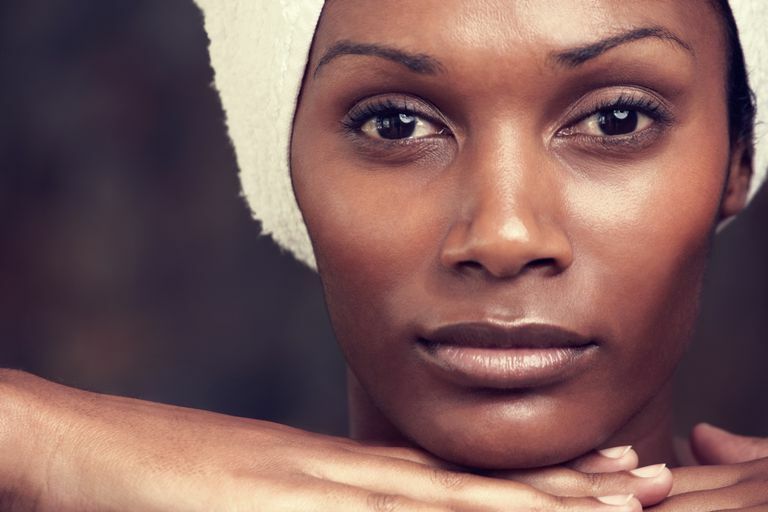 Women of color with darker skin tones are often blessed to have fewer fine lines and wrinkles than white women and even some women of color with lighter skin. This is due to having more melanin in the skin, which helps protect us from sun damage that will cause wrinkles as we age. As skin ages, there is slower collagen and elastin production (proteins that keep the skin firm and elastic) and the skin also becomes thinner. Skin aging is predetermined by genetics, but skin damage (which we can control) can accelerate the process. Oxidation is a chemical process in which unstable molecules called free radicals attack healthy cells. This will show up as wrinkling, discoloration, sagging skin and other skin conditions. The worse offenders are smoking and sun exposure. Frequent facial movements like smiling and frowning cause expression lines. "Facial expression lines are caused by muscle tension under the skin," write Drs. Jeannie Downie and Fran Cook-Bolden in Beautiful Skin of Color. "When the muscles contract, they wrinkle the skin." It’s the muscle contraction that causes the deep furrows between the brows, forehead lines, squint lines and crow’s feet. You can’t stop some of these expression lines — who wants to stop smiling and laughing? However, there are some cosmetic procedures like botox that help, as the authors explain, because skin that doesn’t move won’t wrinkle. Botox paralyzes muscles and smoothes out wrinkles. It also doesn’t hurt to control those lines caused by worry, tension, stress, and anger with a few relaxation tips and a brighter outlook. I also think hatefulness, bitterness, and other ugly thoughts can have a poor effect on health and therefore your skin. Use skin care products like moisturizers that help plump up the skin and stimulate the production of new collagen. Products with Vitamin A (retinol – available in over the counter products), and Retin-A and Tazorac (available by prescription) reduce wrinkles by stimulating collagen-producing cells. For a temporary fix, botox and fillers with collagen or fat can be injected into lines and wrinkles. For deeper wrinkles, chemical peels, dermabrasion, and laser resurfacing are options, but these treatments are not recommended for skin of color because they can contribute to hyperpigmentation and keloid scarring. Other options: cosmetic surgery and facelifts. But if a scalpel and harsh treatments are not your thing, here are our top natural fixes for preventing premature aging of the skin and improving the appearance of the fine lines and wrinkles that exist. Smoking (and second-hand smoke) impairs blood circulation and robs the skin cells of nutrition and oxygen. This slowly damages collagen and elastin production, among other detrimental effects on the body. Excessive exposure to UV radiation can cause skin damage — sunburn, discolorations and can also become cancerous. Wear sunscreen to prevent further photo-damage. Sun exposure is the biggest cause of premature aging, including fine lines and wrinkles, age spots and hyperpigmentation. Using products for your skin type. Gentle cleansing (avoid excessive cleansing of the face — which can dry out the skin). Avoid products with chemicals that can harm the skin. Use moisturizers with ingredients that protect the skin and improve the skin’s appearance by helping the skin cells retain fluid. This can temporarily plump up the skin and diminish the look of existing fine lines and wrinkles. Regularly exfoliate the skin to prevent dull and dry skin, and clogged pores. Exfoliating helps revitalize skin and stimulate new skin cell growth. Proper nutrition can help delay the onset of premature aging and slow the natural process. Certain ingredients used in anti-aging products, in spite of manufacturer’s claims, aren’t absorbed topically, so eat these foods to help the production of collagen and elastin and deliver skin-loving nutrients to your skin. Dehydration can make the skin look drier, dull, and therefore older. Drink more water to flush out toxins from the body, keep the body hydrated and deliver nutrients to the cells. This helps organs function properly, leading to plumper skin cells and firmer, clearer skin. Some suggest drinking filtered or distilled water to avoid chemicals that might be present in tap water. You can make water more appealing by adding slices of fruit or a few drops of pure fruit juice. Water with lemon first thing in the morning helps the body’s natural detoxification process. While you sleep, the body secretes human growth hormone (HGH), which maintains the healthy growth of body tissues, including the skin. As we get older HGH production slows down and wrinkles start to develop. Lack of sleep triggers cortisol, the stress hormone that reduces normal tissue growth and maintenance. The skin can become drier and susceptible to infection, sun exposure, and other elements and toxic environmental factors that lead to wrinkles.